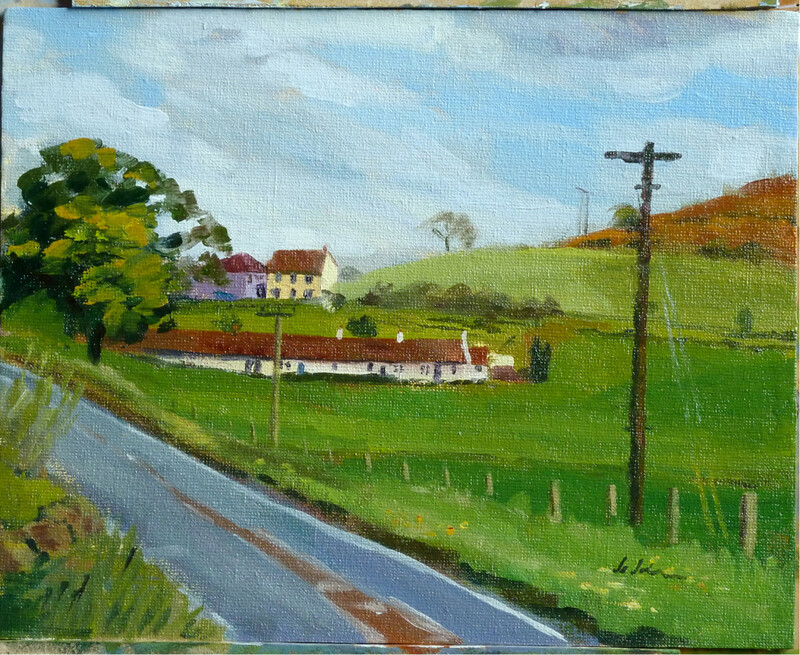 Fresh off the easel today is this wee painting of the hamlet of Rathillet, just beside the A92 in Fife. I really enjoyed working on this and even managed to remember to shoot some video of the event! I travelled this road nearly every day for 16 years and always promised myself I would come and paint this scene one day. I think it’s the juxtaposition of the row of pan-tiled, red roofed cottages with the stately tree beside the road and the gorse covered hill in the background that excited my artistic senses. The gorse is a spectacular golden orangey colour at this time of year, which contrasts beautifully with the blue sky. Just wish I was more accomplished…but I’m working on that! Rathillet was the home of Covenanter David Hackston who was hung drawn and quartered at Edinburgh in 1680 for his part in the Covenanting struggle to win religious freedom in Scotland. The story of the Scottish Covenanters needs to be understood against the backdrop of Reformation history, during a time of great religious and civil upheaval throughout Britain and Europe. A minority of the Covenanters, including Hackston, took up arms in response to the brutal oppression of Charles the second who wanted to reintroduce the idea that the King had a “Divine right” to rule both church and state. The Covenanters believed that God, not the king, had the sole authority in the church and that the Bible, the Word of God was the sole authority in spiritual and religious matters. In 1662 over 300 Protestant ministers were evicted from their parishes and many of their congregations followed them into the fields where they preached at “Conventicles” in the open air, all over Scotland. In 1663 the government attempted to restrict people’s freedom to attend these conventicles and so the persecution of those who opposed the state on grounds of conscience began. And brought it back to live. For these blaspheming men ? The Covenant lives for Aye. Today, religious freedom is under renewed assault and true disciples of Christ must once again be prepared to suffer and even lay down their lives for the noble cause of religious tolerance, freedom of conscience and the right to worship and serve God according to one’s convictions.